Minecraft: Story Mode launch trailer: "Don't think about it. Just play it." I'm still not sure what to make of Minecraft: Story Mode. It may well be excellent—Telltale's reputation as a quality adventure game studio is well-deserved—but "Minecraft" and "story" go together like Max Payne and straight edge. It would be simple enough, relatively speaking, to make a conventional Telltale adventure with Steve and his cubic companions, but that wouldn't really be a Minecraft game, would it? So how do you go about properly blending these two very disparate styles of game? I honestly have no idea. Anyway, Minecraft: Story Mode is out today, and there's a new trailer. 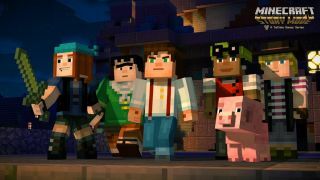 Patton Oswalt is the star of the tale, but I think it's Scott Porter, the voice of Lukas, who really nails the truth of Minecraft: Story Mode. "I know there's a lot of people out there that are wondering how exactly Minecraft and Telltale fit together," he says. "Don't think about it. Just play it." OK then! Minecraft: Story Mode is available now from fine digital retailers including Steam, Humble, and Green Man.